The Mets’ experiment using Rafael Montero in a one-off start wasn’t a complete failure, but it’s over for now, and Montero is on his way back to Las Vegas. In his places comes Jack Leathersich, a promising chubby lefthanded bullpen strikeout artist making his first appearance in the majors. Leathersich will become the 23rd man to wear No. 51 but just the fifth position player: It’s a number more closely associated with coaches who wore it exclusively until Mike “He was a Met?” Maddux broke the seal in 1993. It’s since been worn by Mel Rojas and Rick White — like Maddux, they were veteran bullpenners whom the Mets rode hard — and in a one-off deal by Lance Johnson on Mookie Wilson Day in 1996. (Wilson, then coaching in 51; swapped numbers with Johnson that day. Johnson had three hits including a double and a triple that day and so dominates the offensive stats in 51). The rest of Area 51 are coaches: Roy McMillan wore it while riding out the string managing the 1975 Mets for fired manager Yogi Berra. Pitching guru Rick Peterson reportedly wore 51 but kept it hidden under his buttoned-up jacket for four-and-a-half years. Most recently it went to another influential coach, Dave Hudgens, whose unorthodox hitting philosophy seems to had made a star of Lucas Duda and a pariah of Daniel Murphy. Other noted 51 coaches: Chip Hale, who I was rooting for to get the Met managerial job that went to Terry Collins; Cookie Lavagetto, an original Met coach; and Wes Westrum, who’d switch to No. 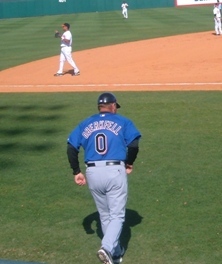 9 upon being named Casey Stengel’s successor. Another rough stretch, another few victims, another media crisis, more angry fans in a panic. So it goes for the Mets, who unexpectedly whacked hitting coach Dave Hudgens — and predictably cashiered gasbag reliever Jose Valverde — following a disheartening Memorial Day debacle. It wasn’t long after Hudgens took leave that his opinions concerning the effect of fans booing and criticisms from team broadcasters were speeding around the circuit, and he followed that up this afternoon by remarking on the team’s “purse strings” — a fresh serving of red meat for stimulated fans who’d somehow convinced themselves that Sandy Alderson hasn’t been deftly splitting hairs for years now when he’s asked about financial constraints governing the ongoing turnaround. That all the issues — the booing, the Keith, the money, the hitting, the bullpen — are at some level related is the story of the season so far and the burden the Mets are dragging around everywhere. And there was certainly a whiff of Wilponian sneakiness to the Hudgens affair. He was quite obviously one of Sandy’s pet hirings, and replaced by a guy, Lamar Johnson, who’d been hanging around Mettown for a decade. On the other hand, maybe parting with Hudgens was Sandy’s offering to the bloodlusters — dopes in the press eager to link the offensive struggles to the organizational hitting strategy as part of an ongoing effort to bring down Sabermetics and prove the Earth is flat — and an acknowledgement that despite the process, the results called for a change. So Lamar Johnson is here, the first No. 57 since Johan Santana — and Hudgens has turned in No. 51. Valverde has turned in 47. Elsewhere we’ve seen the return of Matt den Dekker in No. 6 and Josh Edgin in 66, and Vic Black, still No. 38. That’s what we did to and from Hawaii and now I’m back. Mets coaches in the meantime are busy flying into new and kinda weird unis, as you guys were astutely noting below. Hitting coach Dave Hudgens, whose No. 52 went to new reliever Ramon Ramirez, dropped a digit and is now wearing No. 51. First base coach Tom Goodwin has been assigned No. 26 and bullpen coach Ricky Bones takes 25. Tim Teufel, the new third-base coach, is wearing 18 for some reason (an homage to his tormentor and former teammate Darryl Strawberry?) and in a move generating some controversy, new bench coach Bob Geren becomes the first man assigned Jose Reyes’ former No. 7. Now if were up to me I wouldn’t have given away 7 to just anyone — I was hoping a guy like Reese Havens might be next — but if you want to look for something significant about Geren there’s this: The number with which he has the most equity isn’t 7 but 17: That’s what he wore as as manager of the A’s (and also as a player with the Padres). Considering 17 was also theoretically available for these Mets, its another indication that the organization appears to have turned the corner on Keith Hernandez. That number isn’t going anywhere. No. 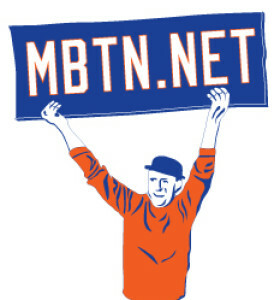 8 in the meantime is making a return as a jersey patch honoring Gary Carter, as seen above. Looks nice. Finally a note on Tom Goodwin. As he explains in this article, Goodwin was one of those players who was wearing 42 as a tribute to Jackie Robinson but was not grandfathered in when Bud Selig made a show of retiring his number leaguewide in 1998. Thanks to EdgyDC for unearthing that. Meantime, batting practice pitcher Eric Langill and bullpen coach Dave Racianello, previously listed as wearing 53 and 54 respectively, have been reassigned 78 and 79, respectively. The Mets on Monday named a pack of coaches to accompany new manager Terry Collins, including newcomers Jon Debus (bullpen coach); Ken Oberkfell (bench coach) and Dave Hudgens (hitting coach) and a returnee, first-base coach Mookie Wilson. They join returning third-base coach Chip Hale and pitching coach Dan Warthen. Do any of these men speak Spanish? Uniform numbers have yet to be assigned to these guys but let’s start with the obvious: If the Mets can manage to get rid of Luis Castillo then No. 1 would be available for Mookie. The Mookster wore No. 51 as a coach in 1997 before No. 1 became available to him, and 51 most recently belonged to Mook’s cross-diamond counterpart, Chip Hale. So there’s some drama whatever happens. I’m intrigued by the possibility of Ken Oberkfell donning No. 0, as he did when I snapped the above photo a few spring trainings ago. The idea of his being a foil and aide-de-camp for Collins wearing No. 10 makes sense, and if Mookie gets No. 1, well that’s even better. I have no idea and no real opinion on what numbers Hudgens and Debus show up in but it wouldn’t surprise me if they show up in 52 and 53 like Met coaches often do.